You may remember my awesome cousin Catherine from such posts as "Porque no los dos?". She loves all things Mexican (including her boyfriend Oscar! 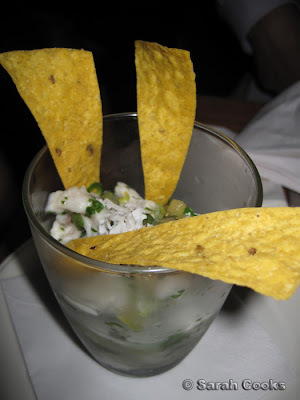 ), so it was only a matter of time before we made our way to Mamasita, the new modern Mexican restaurant and bar that everyone is raving about. To be honest, we actually tried coming a couple of weeks earlier, on a Friday night at 7pm. HAH! When we were told we'd have to wait about 2 hours, we gave up and went around the corner to the City Wine Shop. This time, we were strategic about it: we arrived at 6pm on a Monday night and got a table straight away. Hah! We also brought Oscar with us for authentication purposes. 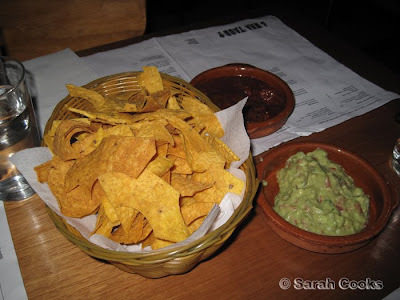 Sandra got there before the rest of us, and ordered some tortilla chips for us to nibble on as we perused the menu. It came with "los dos", salsa AND guacamole. Cue fits of giggles from my cousin and I, as we repeated "Porque no los dos? ", and hummed the Old El Paso song, haha. Yeah, we have a weird sense of humour. The guac was fresh and tasty, but the chips needed a lot more salt, and we all agreed that the salsa tasted like it came out of a jar. It took us a little longer to decide than we expected, so we ordered some corn to keep us going. I loved the corn! 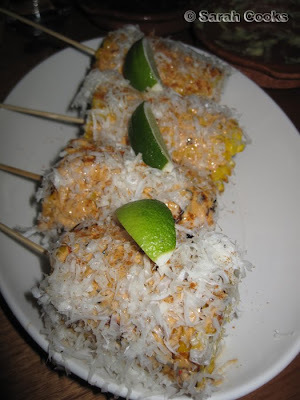 Under the mountain of parmesan was a smear of a delicious spicy mayo and the corn itself had a wonderful smoky taste. Catherine found the parmesan a bit strong - in fact, I think she used the word "offensive" - but I love parmesan, so that wasn't a problem for me. It took us a bit longer to get our heads around the rest of the menu - there was a selection of ceviche, tacos, tostadas, quesadillas, ensaladas and some comida para la familia (main meals). We saw a few tables around us ordering the tostadas - little corn crisps with various toppings - but at $12 for 4 we didn't feel that they would be very filling, or good value. Perhaps better with a drink than as part of a meal. The menu has the Mexico City metro map on the back, which was a really cute touch. Oscar wanted to take the menu with him because it reminded him of home! For starters: Cuz got ceviche, Oscar ordered 2 meat-filled tacos, and Sandra and I shared a bean taco. Some condiments were brought to the table as well - 2 bottles of hot sauce, and a bowl of a dark-green oily sauce that the waitress told us was pico de gallo, but didn't look like any pico de gallo that any of us had ever seen! It tasted good, but as Oscar confirmed, it just wasn't pico de gallo. I tasted the ceviche, and loved its tangy freshness. Cuz, however, was disappointed at the lack of promised coconut milk. When we asked our waitress, she informed us that it was actually a mix of coconut water and coconut milk, not thick coconut milk. I enjoyed the soft, warm tortillas, but Oscar commented that they weren't handmade, and weren't "real" tacos because they were made of corn, not flour. Or maybe they were made of flour, and "real" tacos are made of corn? I'm not sure. He didn't care too much for the pork one, but thought the lamb ones tasted like the ones back home. Fantastic! The bean filling was great - hearty but not stodgy, and it had some chilli and slices of cactus inside. I put some of that green hot sauce on my half of the bean taco, and boy, was it hot!!! Go cautiously. 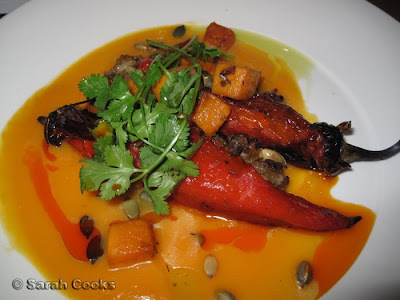 Sandra enjoyed the chilli relleno, and don't you just love the bright colours? Cuz and Oscar shared the prawns, which looked quite impressive. The green almond sauce had a very subtle, fresh flavour. Again, however, Oscar commented that it didn't taste Mexican at all, and that he'd never seen or heard of a dish like this back in Mexico. I think I made the best choice of the night, ordering this big bowl of juicy, crispy ribs. 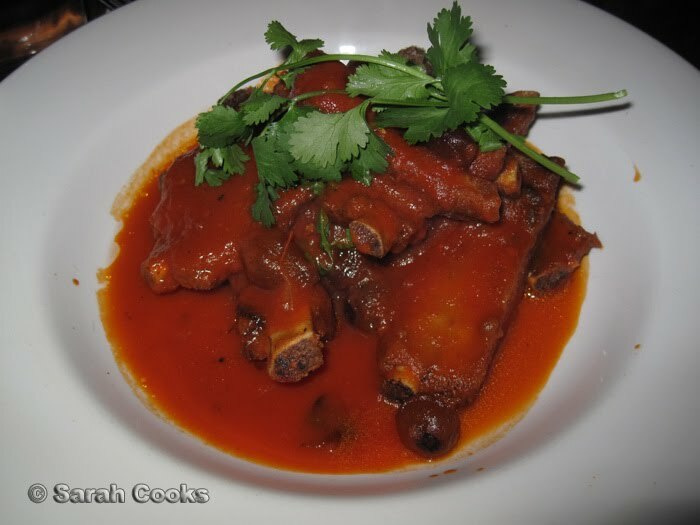 Apart from tasting great, I think these ribs were the best value dish of the night. $12 for 4 little tostadas or $18 for a big bowl of ribs? The ribs WIN! The meat was tender and had small crispy pockets of fat - delicious. There was also heaps of sauce, perfect for scooping up with a tortilla or soaking into rice. I ordered some plantains on the side, not because they matched, but because I am fascinated with island food - you know, plantains, yams, taros etc. 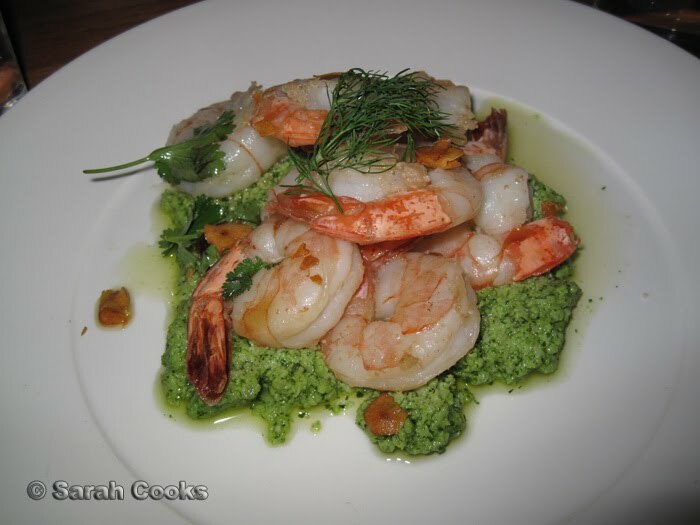 (Other examples include the food in Vanuatu, or the Carribbean food I had in London). 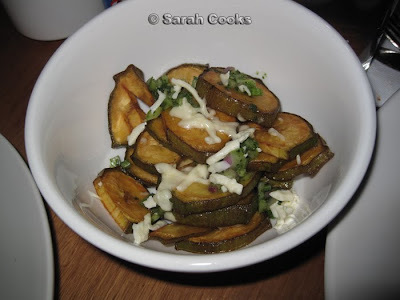 These plantains were thinly sliced and deep fried with the skin on, and were delicious! They didn't have a banana-y flavour at all, but tasted like soggy fried potatoes. (And y'all know how I feel about soggy chips!) They didn't seem to be seasoned very strongly, if at all, and needed a lot of salt. For some reason, there was no salt provided on the tables, but it was quickly brought out when requested. I didn't get photos of them, but we also ordered a bowl of plain rice, some frijoles and 2 serves of tortillas. Apparently tortillas and beans is about as Mexican as you can get, and Oscar was wolfing them down! So, you might think all that food was enough, but not for us. Catherine and I ordered a dessert of arroz con leche to share, whilst Oscar ordered another 2 lamb tacos. I find it interesting how people can always eat huge amounts of the food they've grown up with. You can see how much Oscar was eating on this occasion, Sandra can always eat heaps of schnitzel and potatoes, and put me in front of a Chinese banquet and it will be demolished! 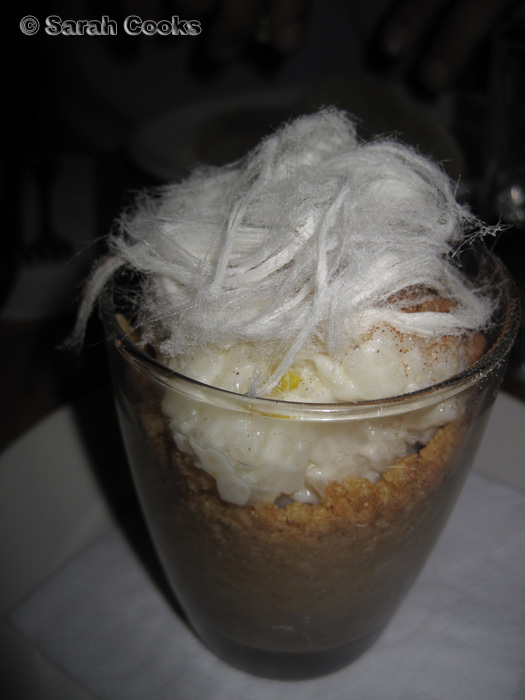 The arroz was topped with Persian fairy floss, and interestingly, there was a crumbed base, much like a cheesecake. I don't think it quite worked - the arroz was already quite dry, and the crumbly biscuit base just exacerbated the dryness, making it catch in our throats. Not counting the crumbs though, the pudding itself was quite good. Overall we enjoyed the meal at Mamasita, and I probably would go back again, especially to try out their drinks. The service was good too, with our waitress being very knowledgeable about the whole menu. The food came out at a reasonable pace, despite the ever-increasing number of customers. However, it was a little expensive, and definitely not authentically Mexican. Not that I'm that fussy, I mean, I eat POCHACHOES! But Cuz and Oscar were a little disappointed with the authenticity of the food as a whole. I'd be more inclined to call it modern Mexican, with the reinterpretations of traditional favourites like pico de gallo, arroz con leche and so on. The search for authentic Mexican food in Australia still continues. I am trying to get Oscar to lend me his sister's tortilla-maker and organise some sort of Mexican fiesta, so watch this space! Yes. This place is sadly overrated by hipsters and those perpetuating Mamasita's own myth as 'authentic Mexican'. 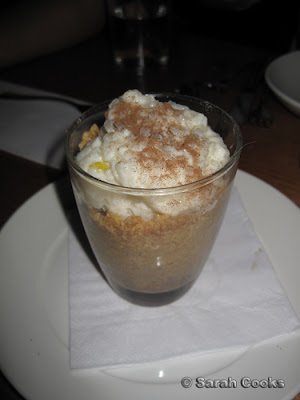 Come on Melbourne food bloggers, why agree it is authentic if you don't know what the term really refers to? I would be happy if Mamasita was self-described as 'contemporary Mexican. That would be justifiable. Although I think Maya's in South Yarra takes the title hands down. I also felt ill two hours later after our Mamasita dinner, but I think it was a case off too much acid from the ceviche just before bed. Oscar, as a health practitioner, would recommend eating this dish earlier in the day. Mamasita seems to be really fond of dill, which was sort of ominipresent in the menu. Despite me never coming across it in Mexico, it has a nahuatl name 'epazote' so I am guessing it might be native to the region. Either way, I like the herb. Desipte the unual and subtle flavour of the almond and dill camarones, I think this desh isn't the best value and sort of awkward. You can't eat it by itself but it doesn't go with any of the accompaniments. I'm looking forward to our Mexican fiesta where we'll hopefully be putting some yummy dishes together with Maya's head chef! And the corn tortillas are authentic, I suppose, because Mexico has both flour and corn tortillas. To give you a little background, the flour ones you only use for quesadillas, fajitas and burritos; the latter of the two being more northern aka Tex-Mex foods. 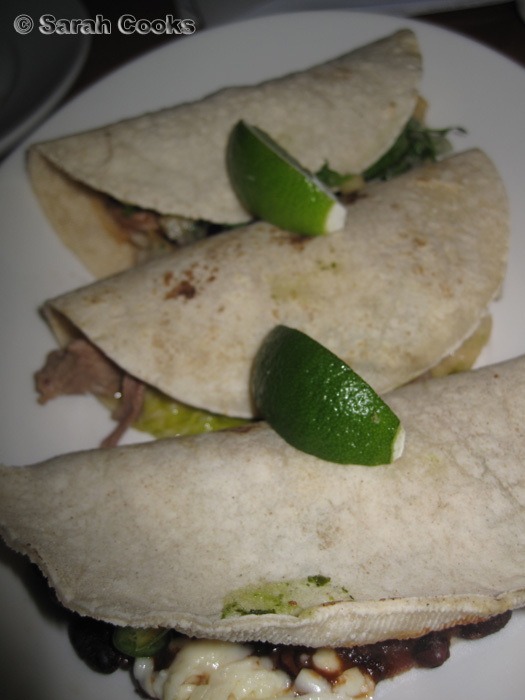 In general in Mexico the corn tortillas are more commonly eaten and almost always accompany a dish. Sort of like a side order of bread but more common over there than bread is here. But the corn tortillas at Mamasita certainly don't appear to be homemade. Homemade ones are usually three times thicker and are sort of lumpy and have an uneven thickness. Interesting read. I went there the first week of their opening. Did not enjoy the meal at all. Thought that the flavours just weren't punchy Mexican flavours. Anyway, I have very little knowledge of Mexican food. I will go back there to try again. I have to agree. The search for "authentic" Mexican as well as other rarer cusines such as Polish, Austrian and German continues in Melbourne. In regards to the argument of it being "authentic", does it really matter when the food is delicious? It's close enough anyway! Also, the menu came from the owners' travels to South America and New York City (where one of them worked). So it explains the "fusion" menu.